Organizations are looking to cloud computing to provide a more efficient, flexible and cost-effective model for computing-one that allows IT to operate much more efficiently and respond faster to business opportunities. The goal is to enable IT as a Service, and cloud computing provides the technical architecture to deliver it. Today, more than 190,000 customers and 25,000 partners rely on VMware solutions to achieve their business goals. VMware offers a unique, evolutionary path to cloud computing that reduces IT complexity, significantly lowers costs and enables more flexible, agile service delivery. 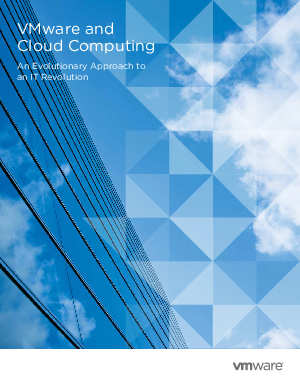 Access this paper for a detailed look at the VMware approach to the cloud.